One of the most remarkable archaeological finds of recent times was made in the fossil-rich area of the Gauteng Province, South Africa, known as the Cradle of Humankind. 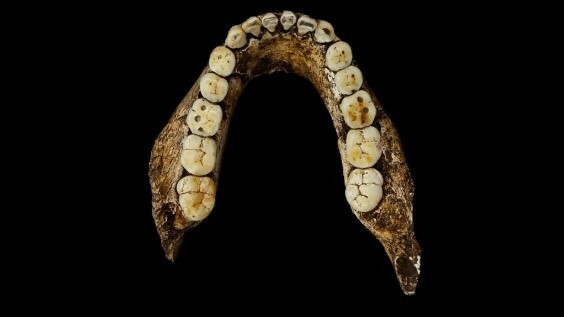 The find, first announced in November 2013, was made in a cave named Rising Star (Dinaledi in Sesotho, one of the local African languages) about 50 kms northwest of Johannesburg and about 16 kms from the Malapa cave where six skeletons of Australopithecus sediba were found in August 2008. The fossils were found to have certain features in common with Homo sapiens and were thus announced to be a new species of the Homo genus, even possibly the very root of the Homo genus – and not Australopithecus. 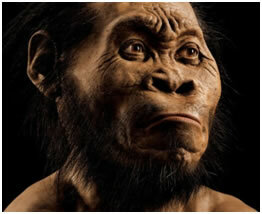 It was named Homo naledi (Star in Sesotho) after the cave in which the fossils were found. This declaration has been somewhat controversial, with some scientists believing instead that they are a branch of Homo erectus and not an entirely new species. 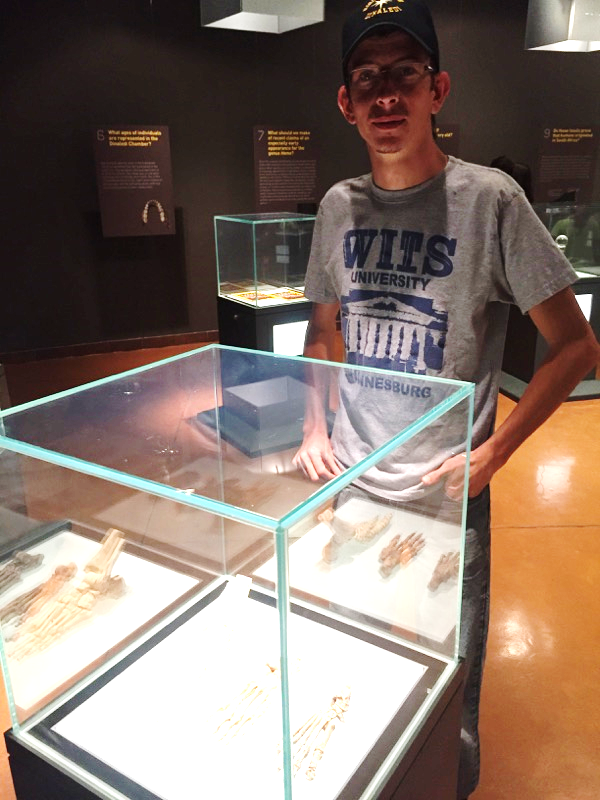 Two young cavers, Steven Tucker and Rick Hunter, while exploring the Dinaledi cave system initially found part of a jawbone and, after establishing that it was not the jawbone of an unlucky previous explorer, realised that they had found something noteworthy! 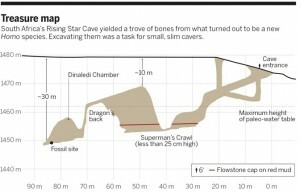 While the opening areas of the cave have been well explored by local groups, the deeper aspects are extremely difficult to navigate, having two exceptionally narrow passageways (see Science’s diagram) and show no evidence of recent human visitation. The fossil site certainly was undisturbed. The first narrow passage is named Superman’s crawl because any wiry individual able to navigate it is only able to do so by keeping one arm firmly by their side and the other extended above their head, like Superman in flight! The second is approached by climbing the area known as Dragon’s back and in places is only 18 inches wide. It then drops steeply like an extremely narrow chute into the fossil site. A small group from The Academy For Future Science, South Africa that went to view the display at Maropeng, the center established in Cradle of Humankind for the display of fossils and discoveries made in the area, was able to meet Rick Hunter (below) and get a firsthand description of their experience. When Prof. Lee Berger of Wits University saw the photographs of what Tucker and Hunter had found, he sent out a call for ‘small’ scientists to explore the fossil site and obtained funding from National Geographic. 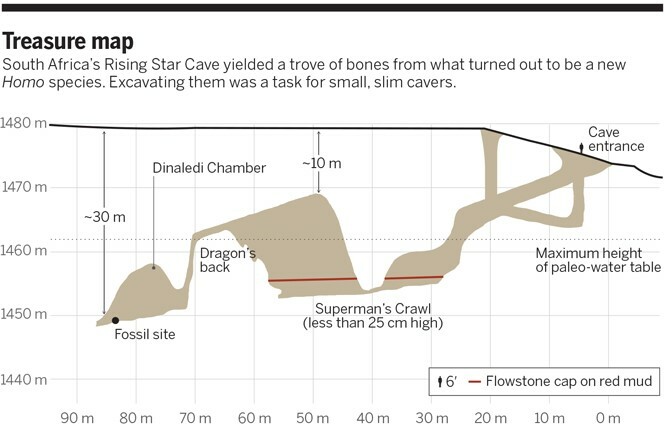 Six brave women were selected to go into the fossil site and after painstaking work and exploration, Homo naledi was finally revealed to the world in September 2015 by the Rising Star expedition team. While only a very small portion of this amazing time capsule with so many fossils found in the same area has been uncovered to date, the paleontological team has found intact skeletons (some 1,550 fossil elements in all) of every possible age, specifically they found the bones of infants, children, adults and an elderly individual believed to be female. There is a promise of more to come with at least one further major announcement expected soon. The question of how H. naledi came to be in the depths of Dinaledi cave has led to an intriguing theory. There is no indication on their fossilised bones of large carnivore activity and only very few rodent and bird skeletons have been found on the site, thus being dragged into the cave and eaten by a carnivore has been eliminated as a possibility. There is also no indication that the bones were carried to the site and deposited by water activity such as flooding. Therefore, after some determination the scientific team realized that the fossils had not ended up there because of some catastrophe but rather through a meticulous operation of several burials over a period of time.This has led them to the conclusion that H. naledi demonstrated the unusual characteristic of burying their dead and showing the trait of human compassion or ritual comprehension by the placing of their dead in a special chamber. Research to date indicates that on average Homo naledi was approximately 4 ½ft or 1.5 metres tall and weighed about 90 pounds (45kg). 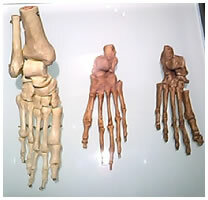 More recent work (March 2014) on one of the skeletons has confirmed the great similarity between the hands and feet of this ‘new species’ and modern man. 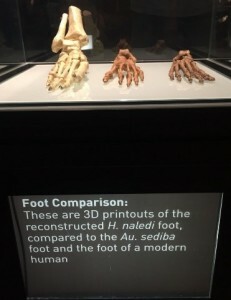 The shoulders are narrower and more ape-like, more suited to climbing, but the feet are much closer to ours, and although their feet are flatter than ours, H. naledi were clearly bipedal (see images below – H. naledi foot on the right, ours on the left). However, their hip and thighbone seem much more primitive. While the hands and wrist are more human-like, possibly suited to making and using tools, they are a little different, that is the last digits of the hands are more curved, typical of primates, and again, suited to climbing. Also, the thumbs are longer. H. naledi’s brain is said to have been the size of an orange, about half the size of Homo erectus and its skull has about half the brain volume of a modern human skull. 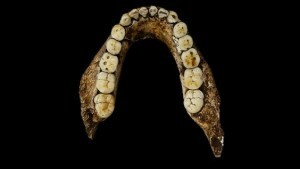 However, its teeth were smaller than average for any early Homo species, a trait usually associated with eating more calorie-rich foods like meat or starchy tubers, according to John Hawkes, a core scientist on the Rising Star Expedition team. While they have many features remarkably similar to Homo sapiens, they also display features that appear to be even more primitive than Australopithecus. Although specific dating has not entirely been confirmed, it is believed that this species lived one to three million years ago. If it turns out that they lived one million years ago or less then they would have co-existed with other early species of the Homo genus. The remarkable find of Homo naledi is thus adding to the growing realization that there was more diversity in the evolution of species than ever imagined before, and that ritual behaviour and compassion for life may have been a much earlier development than was previously thought. It appears that this trait may not have developed exclusively in Homo sapiens.